I'm not a huge fan of sun dried tomatoes, but these guys are great for salads, sauces or just munching on. I make them with the oven on, but if you've just finished using the oven, you can pop these guys in and let them dry as the oven cools. Use any fresh herb or combination of fresh herbs that you like. I grabbed some parsley and oregano from the backyard for this batch. Cut cherry tomatoes in half lengthwise and place in a pan. Spray with canola oil spray or drizzle with olive oil. Sprinkle with salt and chopped herbs. Add tomatoes to the oven and let dry for two hours or until sufficiently shrivelled. Enjoy! I had no idea that making oven dried tomatoes was so easy! I love tomatoes and will have to try this! Thanks! I appreciate your blog and its many fine articles. I am going to make the oven dried tomatoes as soon as I make a trip to the market. Thanks for the directions and recipe. Those are totally awesome - oven dried tomatoes have MADE a few of my pasta dishes! 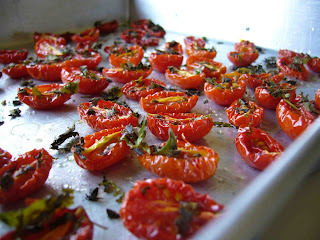 The 3rd blog today that featured oven dried tomatoes. I've made them before and they're fabulous. Can't wait to hit a farmers' market. Hi Sarah - I've never tried using them in any of my pasta dishes...great idea!